Tom Charlton, 72, is the younger brother of World Cup winners Jack and Bobby Charlton. A member of Mature Millers Walking Football Club, attached to Rotherham United, he made his England over 60s debut in the 3-0 defeat of Italy at Brighton’s Amex Stadium. Before the game Jack sent a good luck message from himself and Bobby. Tom is an ambassador for the Walking Football Association. He was a miner at Lynemouth Colliery and played in the Ashington Welfare League before injury curtailed his amateur career He moved to Rotherham with the Miners Rescue Service. Tom gives a revealing insight into what life is like being part of famous footballing family in conversation with Ken Gaunt..
Where were you on that day in 1966 when England won the World Cup? I watched the game on TV with my then girlfriend at her house. The reason I did not go to the game was because I was an apprentice at the pit and I had no money. I did not know how to get to Wembley, I did not know where I could stay and I was most definitely not going to ask Bob and Jack for money at a time like that. They had far too many things to do without worrying about me. Within our family the pride and joy at the achievement was indescribable, I thought Mum and Dad were going to burst, I felt exactly the same, it was a wonderful time. Congratulations on playing for England walking football over 60s. How did that feel at your age? It was absolutely wonderful to be able to pull on an England strip and represent my country. The Italian team were very sporting and genuinely nice guys. It was a privilege to play against them. To win in the very first International match ever played at walking football in England will remain with me for the rest of my days. Can you tell me what your football background is. Did you play professionally? I played amateur football until I broke my kneecap in a friendly game. Since then I have played intermittently on an amateur basis. I never seriously tried to get into the professional game mainly because of the brilliance of my brothers, how can a mere mortal compete with that? 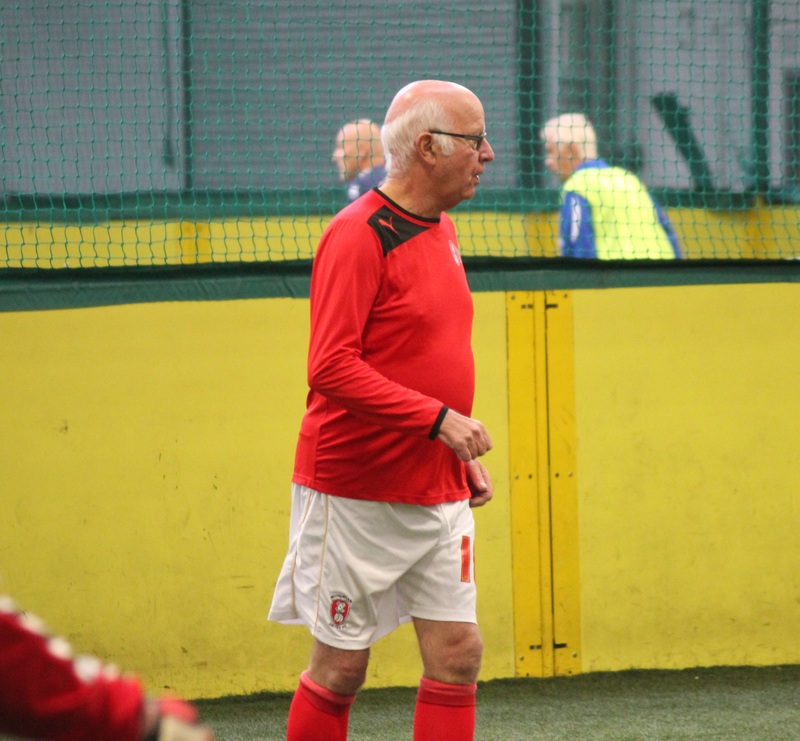 How long have you been playing walking football and what made you take it up? I started playing about six years ago when Rotherham United Community Sports Trust started the sport at our local leisure centre. I took one look and decided immediately that it was just what I needed to lose weight, to get fitter and to meet new friends. I have never made a better decision in my life!! How have you coped with being Jack and Bobby’s brother? I am lucky to have two brothers who care very much for me, we have always got on tremendously well. It has always been difficult to get people to realise that we are…brothers. I can honestly say that there has never been a moment in my entire life when I have felt anything but proud and privileged to have been given the opportunities to be part of the famous Charlton family. You have appeared on TV and radio recently and stories written about you in the papers. How has that been for you? I have tried to use the time to encourage other older people like me to give walking football a try. I am not very important but it IS very important to let others know the very real benefits that they can achieve. If I can do that then all of the press and TV interest will have been worth it and I get a lot of satisfaction from that.